Our full collection includes 11,000+ objects that rotate in and out of view. Modern and contemporary art is at the heart of the museum’s identity and its mission. The modern and contemporary collection contains approximately 3,000 sculptures, paintings and prints, 2,000 fine art photographs, and another 40,000 negatives, contact sheets and other photo-based objects. Given the international reputation of Palm Springs as an epicenter of mid-century modernism, art from this period forms the foundation of the museum’s collection. Significant paintings, sculptures, and works on papers by earlier modernists illuminate the development of modern art’s experimentation with form and materials. The museum’s dynamic collection of contemporary art since 1960 places special focus on artists from California alongside artists working throughout the United States and internationally. Marina Abramović, Louise Bourgeois, John Chamberlain, Antony Gormley, Duane Hanson, Mona Hatoum, Anish Kapoor, Anselm Keifer, Sarah Sze, and Stanley Whitney are among the many contemporary artists represented in the collection. 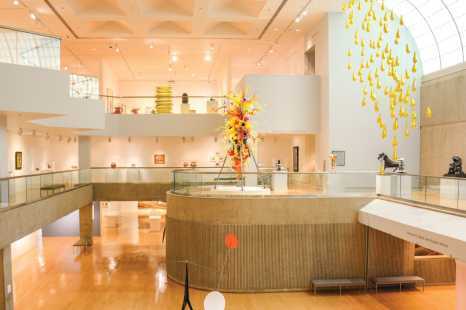 The collection’s modernist holdings include key paintings and sculptures by Alexander Calder, Claire Falkenstein, Helen Frankenthaler, Barbara Hepworth, Henry Moore, Roberto Matta, Robert Motherwell, Agnes Pelton, and David Alfaro Siqueiros, among others. Artworks by significant contemporary artists producing on the West Coast include Robert Arneson, Lynda Benglis, Joan Brown, Mark Bradford, Armando Lerma, Nathan Oliveira, Rubén Ortiz-Torres, Edward Ruscha, and Andrea Zittel. The museum’s rich holdings of historical works by Native Americans are complemented by a growing collection of works by contemporary Native American artists including Rick Bartow, Gerald Clarke, and Cara Romero. The museum also holds a wealth of photographs reflecting the development of this pivotal medium for 20th and 21st century art and culture. The photography collection contains prints by artists Ansel Adams, Diane Arbus, Walker Evans, Nan Goldin, An-My Lê, Milton Rogovin, Arthur Tress, and Andy Warhol, among others.